Explore this hidden side of Mexico in a Puerto Vallarta boat rental. Check out incredible beaches like Bahia de Banderas, and visit Bucerias for incredible oceanside views of the Pacific. Puerto Vallarta is among the top tourist destinations in Mexico. One of the most popular things to do is to head down to the south shore with its shimmering turquoise blue waters or Yelapa Town which features waterfalls, hiking and a hidden beach! Afterwards, you can head out to the boardwalk for a lovely stroll on the town. Both on and off the shore, there are so many great places to see in Puerto Vallarta. Many people head over to Bucerias which is a great little town and surfer’s paradise. Another place you cannot miss is Bahia de Banderas which is one of the best snorkeling spots in the region. Another top destination is the Zona Romantica, which is filled with charming buildings and some great beaches. With your own boat, you have the freedom to go wherever you want. That said, you might want to be pointed in the right direction to really see some incredible stuff. One place you can’t miss is Los Arcos (the Arches) which is considered to be one of the best spots in the area. There are seasonal changes about the best places so ask your captain and see if he has any secret places that he knows about. It’s really hard to rank this a second. Puerto Vallarta is one of the best fishing destinations in Mexico. And that means a lot because Mexico has some of the finest fishing in the world. Whether you are looking for marlin, sailfish or tuna, the waters off Puerto Vallarta have some of the biggest fish in the game. 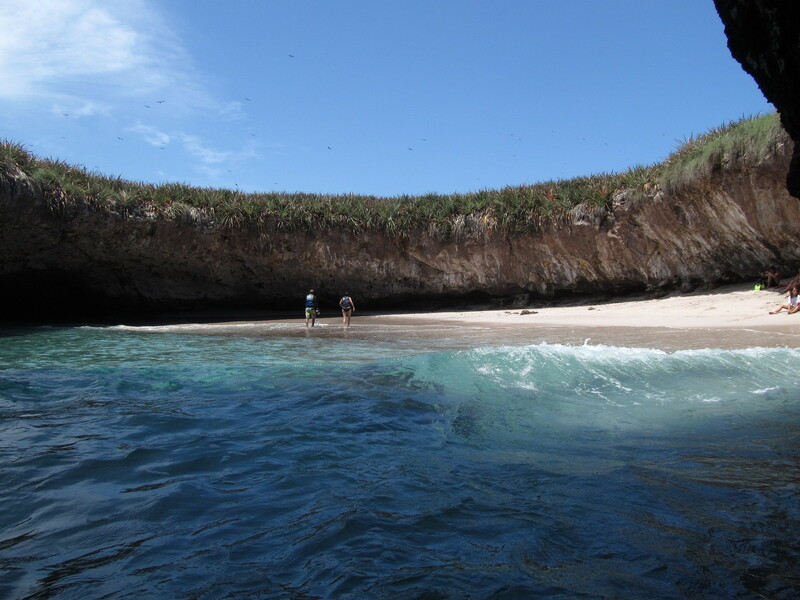 The Marieta Islands have been nicknamed the Mexican Galapagos. Another great destination for scuba and snorkeling, they are located just a few miles off the coast from Puerto Vallarta and are complete with secret beaches to kick back and relax on and are truly just a great sight to see whether from the deck or from the ocean depths! Bahia de Banderas in one the top beaches in Puerto Vallarta and it is a natural paradise for parasailing. Year-round the conditions are perfect there for parasailing as the sea is quite calm. If parasailing isn’t your thing, there are a wide variety of other watersports you can do there from water skiing to wakeboarding! The best thing about Puerto Vallarta is its natural beauty. And there is no better way to enjoy some of these amazing places than with a few glasses of wine among friends. Mexico is home to a great wine country just a few hours away from Puerto Vallarta and there is no better place to do a wine tasting of the local vintage than from the deck your boat charter. As such as famous fishing destination, you can imagine that you have some great choices in this department and nothing beats Cevicheria El Guero which features all the best fresh catches of the day. They are legendary for their mahi-mahi which is served raw and seasoned with a dash of lime and a few other tricks. They also have an array of different salsas and chiles you can make things as spicy as you can handle! Afterwards, you can cool things down with a coconut from Cesar’s Coconut Stand which has been around for nearly 50 years. Their coconuts are the freshest in town and you can watch them crack them open with large butcher knives and just pop a straw right in there to enjoy! When you finish drinking the coconut juice, they will carve it open for you so you can eat the delicious coconut meat inside.